The Domestic Dog we all know & love came from wolves being domesticated over 14/15000 years ago and recent studies show that even now if wolf pups are taken away from their mothers and reared by humans they socialise well but if left more than 2/3 weeks with their natural mothers it is far more difficult to socialise them and not likely to be successful. It's widely thought that early man raised wolve cubs in their own families along with human babies and over time thesewolf cubs began to breed amongst themselves thus establishing a wolve like domesticated animal and over thousands of years this wolve like animal became more dog like and is now what we call today 'mans best friend' and now has various different breeds from the small jack russels up to the large great danes and all dogs come in many different colours,sizes & temperments this initself shows the remarkable diversity in the dog and how it's changed & evolved over thousands of years. Most supposed that these early dogs were descendants of tamed wolves, which interbred and evolved into a domesticated species. Other scientists, while believing wolves were the chief contributor, suspected that jackals or coyotes contributed to the dog's ancestry. 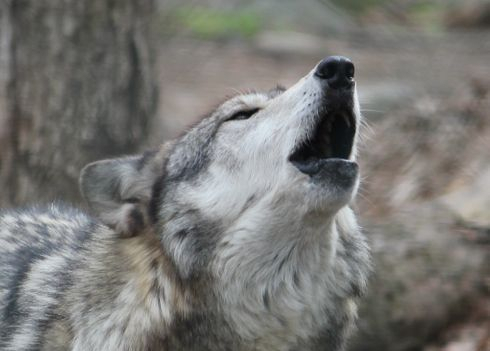 Carles Vila, who has conducted the most extensive study to date, has shown that DNA evidence has ruled out any ancestor canine species except the wolf. Vila's team analyzed 162 different examples of wolf DNA from 27 populations in Europe, Asia, and North America. These results were compared with DNA from 140 individual dogs from 67 breeds gathered from around the world. Using blood or hair samples, DNA was extracted and genetic distance for Mitochondrial DNA was estimated between individuals. Based on this DNA evidence, most of the domesticated dogs were found to be members of one of four groups. The largest and most diverse group contains sequences found in the most ancient dog breeds, including the dingo of Australia, the New Guniea singing dog, and many modern breeds, like the collie and retrevier. Other groups such as the German Shepherd showed a closer relation to wolf sequences than to those of the main dog group, suggesting that such breeds had been produced by crossing dogs with wild wolves. It is also possible that this is evidence that dogs may have been domesticated from wolves on different occasions and at different places. Vilà is still uncertain whether domestication happened once–after which domesticated dogs bred with wolves from time to time–or whether it happened more than once. A later study by Peter Savolainen et al. identified mitochondrial DNA evidence suggesting a common origin from a single East Asian gene pool for all dog populations.However, a more recent study by Bridgett vonHoldt et al. using a much larger data set of nuclear markers points to the Middle East as the source of most of the genetic diversity in the domestic dog and a more likely origin of domestication events. Dogs are now so domesticated and diverse in their nature we humans breed them for certain jobs like the met police breed only dogs they think will aquire the right temperments needed for the police dogs role,or mountain resue dogs are another example,Drug enforcement dogs,Cadaver Dogs for tracing the scent of dead bodies,Dogs for the blind,we even have dogs that can warn their master of impending seizures like epilepsy or other medical conditions. But we should never forget their roots and if dogs are left to their own devices and left to roam in packs with no human contact they can & will return to their prehistoric instints just like their wolf cousins. Established in 1872, Yellowstone National Park is America's first national park. Located in Wyoming, Montana and Idaho, it is home to a large pack of wolves,after becoming extinct yellowstone saw the importance of wolves in the food chain and reintroduced them in March 1995 it was controversial at first as they were absent from yellowstone for more than 70 years but now their numbers have grown and is a great success and the natural balance has been resored to the foodchain in this area, there is still lot's to learn from wolves & dogs alike and there is many ongoing studies by scientists & researchers into both animals and their origins.